Some old film cameras are so inexpensive that when one breaks, you don’t fix it — you buy another one. My Konica Autoreflex T3’s light meter was dead on arrival. I shot it anyway, using a handheld meter — and then the photos I got back blew me away. See some of them here. The 50mm f/1.7 Hexanon AR lens that came with my T3 was outstanding. I knew I’d want to shoot that lens again. I also knew I would prefer a working meter, so I bought a second Autoreflex T3 body, fully working this time, for just $23 shipped. 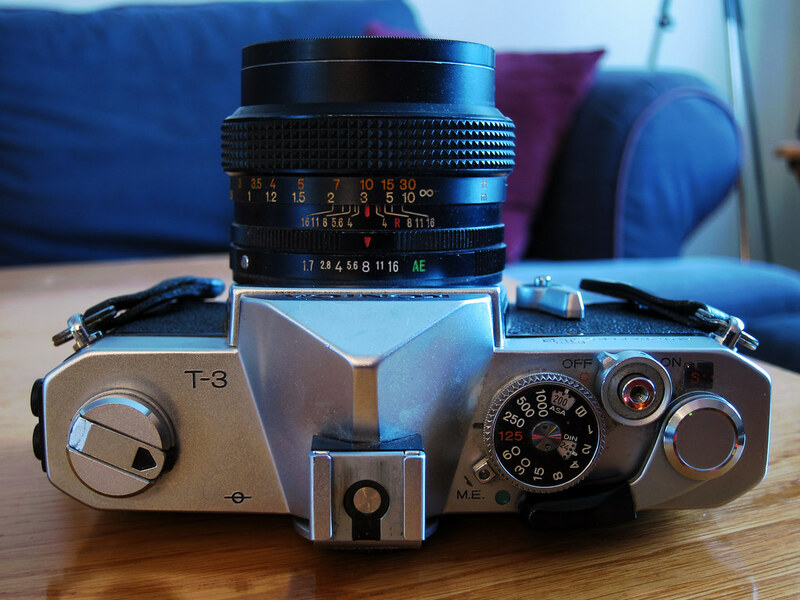 The T3 is typical of early-1970s SLRs in that it is sturdy and heavy. But its shutter-priority autoexposure made it distinctly atypical. 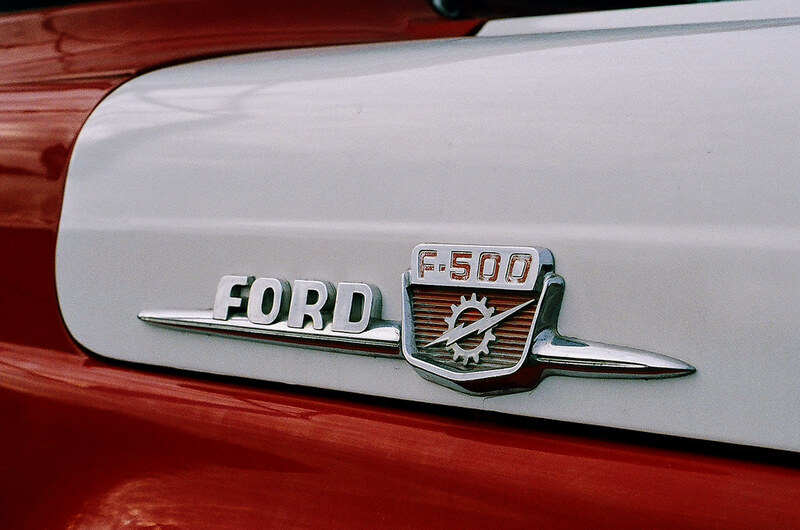 Other manufacturers were starting to build that feature into their SLRs at that time, but it was far from common. Yet Konica had offered it in its Autoreflex line since 1966. The T3 is mechanical except for the light meter. The camera takes two PX675 mercury batteries, which have long been banned. I substituted two SR44 silver-oxide batteries, which are the same size. The SR44s have slightly higher voltage, which theoretically could lead to misexposures. But I got great exposures. 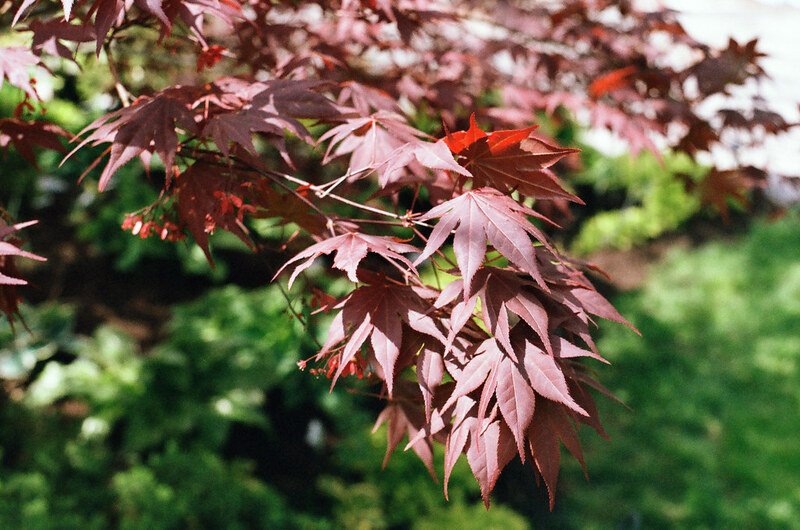 Perhaps it’s because I shot Fujicolor 200, which has wide exposure latitude. This. Oh my, this. This is why I wanted a fully working T3. That 50mm f/1.7 Hexanon AR is just sublime. Just look at the color and detail. The bokeh is like an impressionist painting. 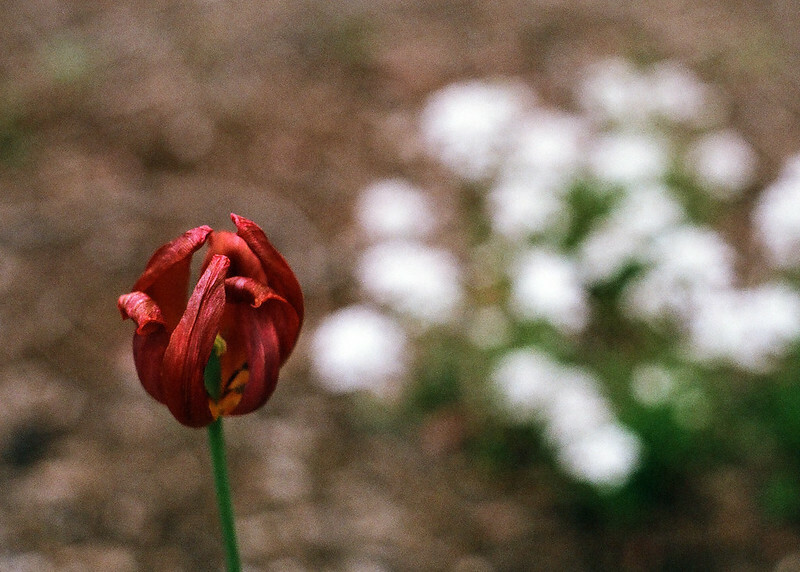 I shot most of the roll around the yard as spring flowers bloomed. 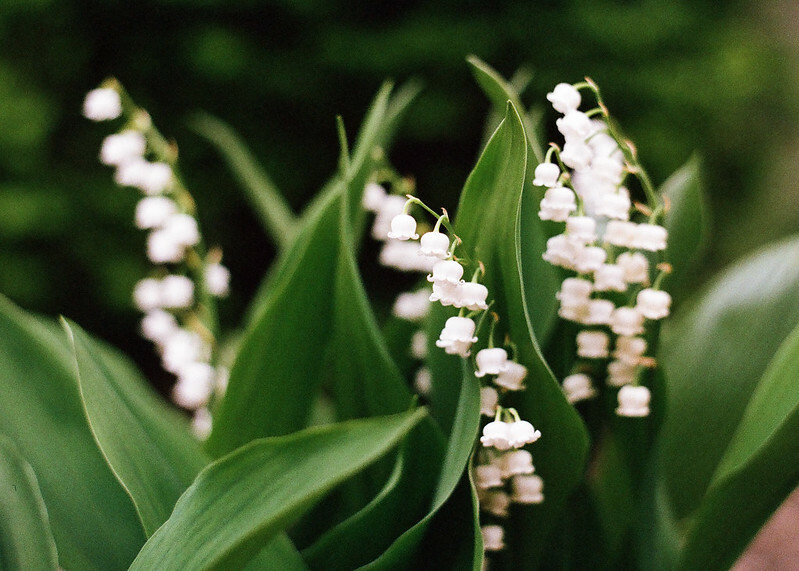 Here are my Lily of the Valley. A fellow from Germany who follows me on Flickr commented that in German, these are called Maiglöckchen — little May bells. Perfect! 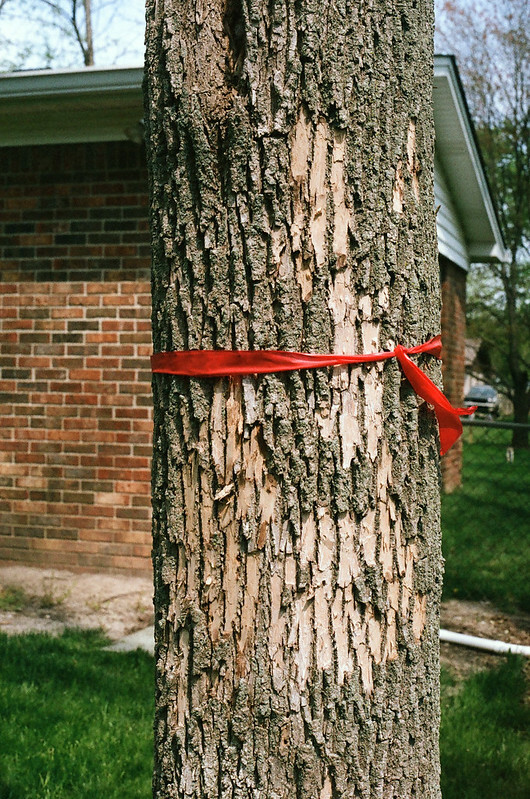 This lens and film love, love, love red. 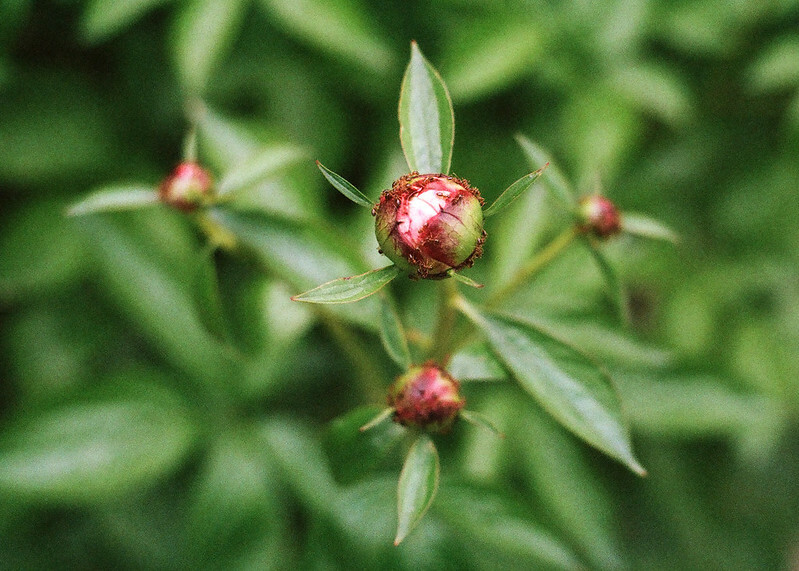 These are peonies working on opening. The buds are always covered with tiny ants. I was less impressed with how purple was rendered. My grape hyacinths are more vivid than this. So are the petunias I keep in a planter on the corner of my front stoop. In real life, these are dark purple, almost black. At least this dusky purple is interesting. But the warm colors I got when shooting this doomed ash tree in my back yard pretty much make up for the inaccurate purples. I shot most of the roll at close range. There was just so much early-spring detail to focus on! 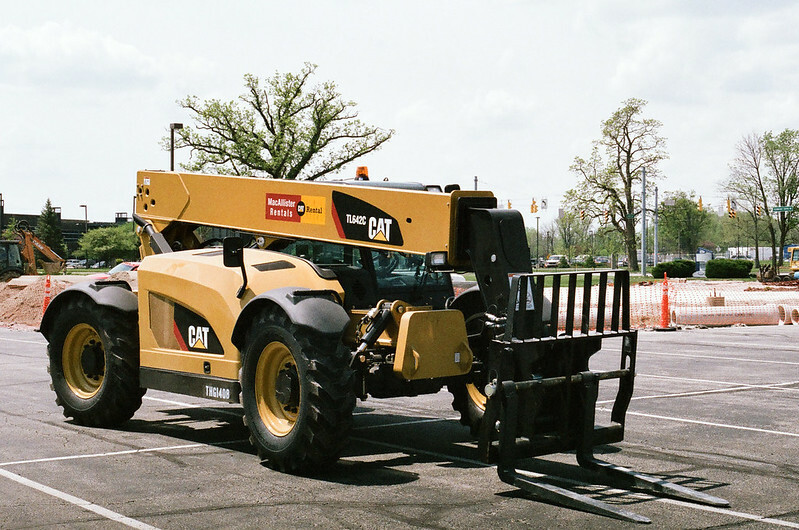 Just to show that this lens does all right at a distance, here’s some construction equipment. 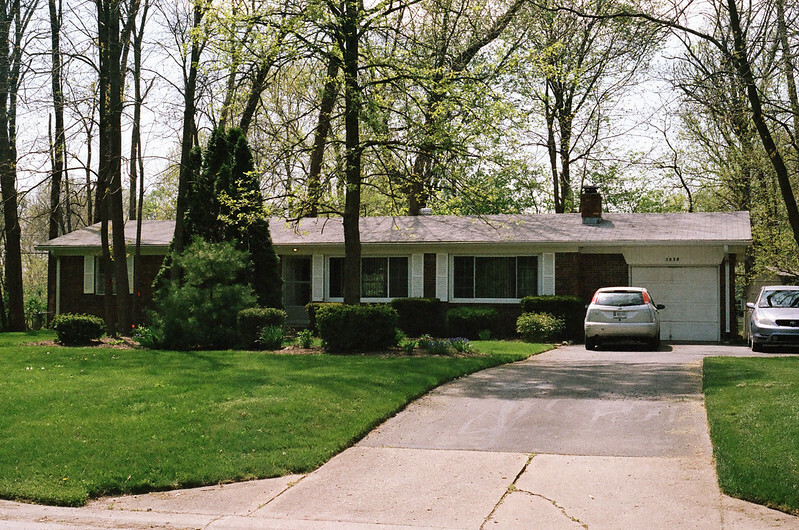 And here’s the front of my house, from about the same time I learned that all of my ash trees were dying. I’ve since had all 21 of those trees removed. 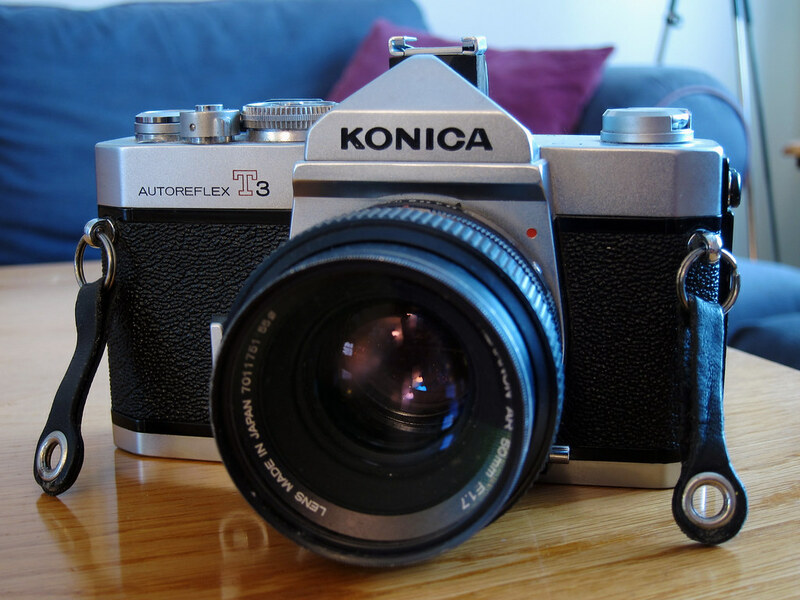 To see more photographs, check out my Konica Autoreflex T3 gallery. I’m putting the Autoreflex T3 into rotation — I will use it again. Its 50mm f/1.7 lens begs to be brought up close to a subject, set nearly wide open for shallow depth of field. I’ll bet it would go to town with some Ektar or some Velvia 50. 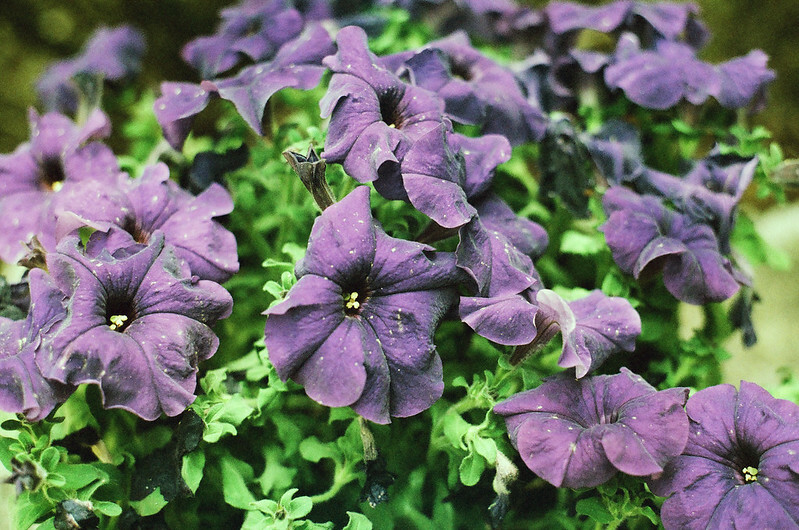 I wanted to share more of the photos I took with my Konica Autoreflex T3. 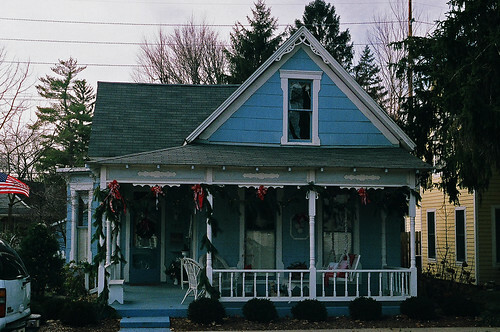 I shot about half of the roll on a walk along Zionsville’s charming Main Street. The first half of Main Street is Zionsville’s business district. I’ve been there, camera in hand, any number of times but have yet to figure out how to really capture it. 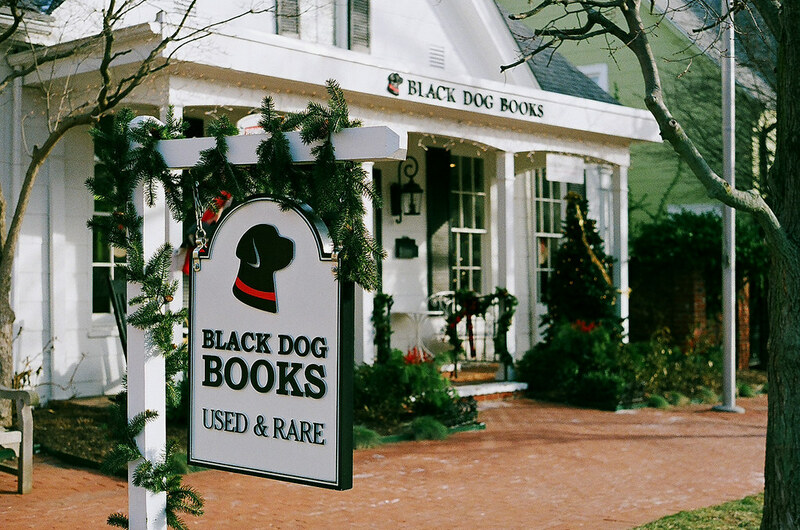 I got a couple shots, though, including this one of a book shop. 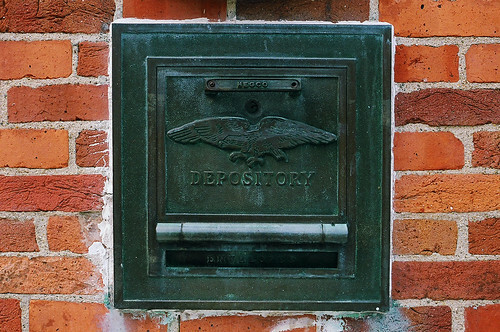 I like how the T3 rendered the gritty details of this depository door. The building doesn’t host a bank anymore. I spent more time taking photos on the residential half of Main Street. It’s lined with older homes that look to have been built between the 1850s and the 1920s. This blue house looks like one of the older ones to me. I like the looks of this bungalow a lot. 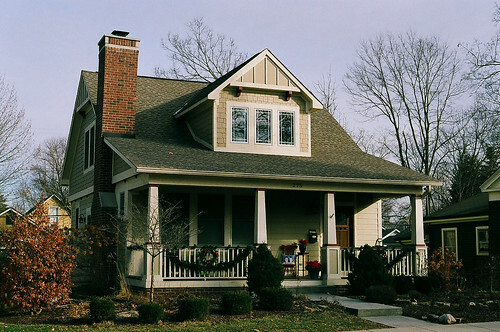 I’d love to live in a home with a wide front porch. I feel nostalgia for a time I’ve never known, one where people relaxed in the evenings on the porch and chatted briefly with their neighbors who passed by on the sidewalk. 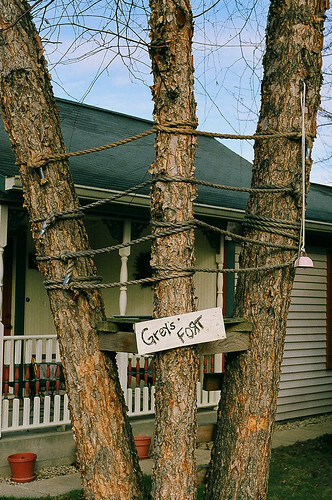 Is Grey the first name of the person who built this fort? If it’s his last name, I’m almost certainly not related to him. 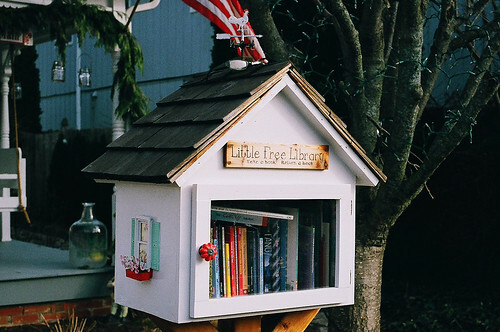 I smile every time I see this little library. I wonder how often books get borrowed from it. I finished my stroll along Main Street quickly; it’s only half-mile long. 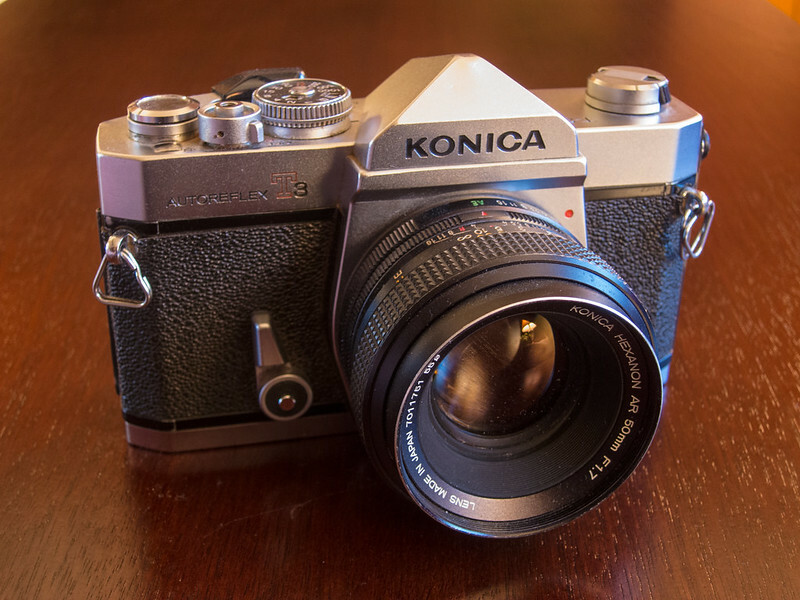 It’s a shame, really, that camera collectors don’t love Konica’s 35mm SLR cameras from the 1960s and 1970s as much as they do those from competitors such as Canon and Pentax. If my Autoreflex T3 is typical, they were wonderful SLRs – well built and great to use. 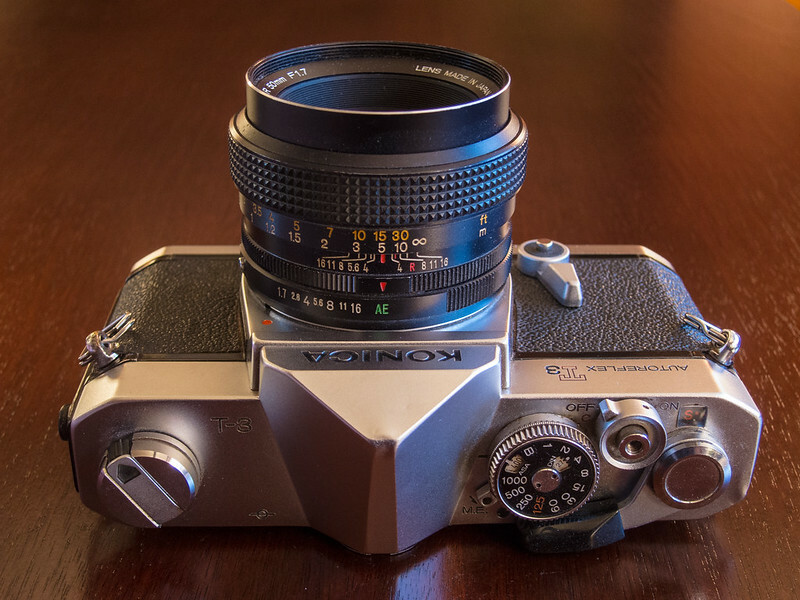 It’s surprisingly not widely known that Konica was the first to offer autoexposure in a 35mm SLR, and that they did it in 1966 with the original Auto-Reflex. Konica chose a shutter-priority system: the camera selects an aperture based on the shutter speed you set. The Autoreflex T3 carried on the tradition when it was introduced in 1973. By then, most other SLRs offered a coupled through-the-lens light meter, but still made photographers set both aperture and shutter speed until a needle in the viewfinder indicated proper exposure. I like it when my camera helps me with exposure, but it’s academic as my T3’s meter is dead. A little searching of the Internet’s old-camera forums revealed not only that the T3’s number one failure point is the electrical connection between the battery and the meter, but also that repairing it is difficult. So I did something unusual for me: I bought another body. But even with a dead meter, the T3 otherwise all mechanical and, as far as I can tell, all metal. It shoots all day without batteries when you set exposure manually. I put a roll through the first body that way before buying the second. But if you come upon one with a working meter, drop in two LR44 or SR44 button cells and away you go. The camera was built for mercury batteries rather than those silver-oxide and alkaline equivalents. The T3 is calibrated for the mercury battery’s slightly different voltage, but most films have enough exposure latitude to cover you. For a 1973 camera, the T3’s specs are pretty fat. Its metal focal-plane shutter operates from 1 to 1/1000 sec. You can set ISO from 12 to 3200. The T3 came with no accessory shoe, but the hot shoe attached to mine was a common add-on. When you attached a flash to it, the camera synched it to the shutter. The T3 features a self-timer, mirror lockup, depth-of-field preview, and (refreshingly) a multiple-exposure lever. I had but one complaint with the T3: its focusing screen offers only a microprism. I prefer the precision of split-image focusing. Worse, my T3’s microprism is faint, making it useless to my middle-aged eyes. I was left to twist the 50mm f/1.7 Hexanon AR lens’s focus ring until the image looked sharp in the viewfinder. Typical of 50mm lenses, the focus ring has a long travel under 10 feet and a very short travel from 10 feet to infinity, making it hard to be sure of proper focus on far-away shots. To cover any focusing sins, I shrunk the aperture as much as I could to broaden the depth of field. A T3 weirdness is that its lens is wide open until you press the shutter button, at which time the blades close to whatever aperture you chose. I think every other SLR I own (that doesn’t require you to stop down to meter) leaves the aperture blades at whatever aperture you set. By the way, if you enjoy all-metal, all-mechanical SLRs, also see my reviews of the Canon FT QL (here), the Nikon F2AS (here), the Miranda Sensorex II (here), the Pentax K1000 (here), and the Pentax KM (here). Or check out all of my camera reviews here. I shot the body with the dead meter on an unusually warm New Year’s Eve. I loaded some Fujicolor 200 into the T3 and drove up to Zionsville, which is just northwest of Indianapolis in Boone County. I found an old fire truck parked in a lot. Just check out this color! This used bookstore has become one of my most-photographed subjects. 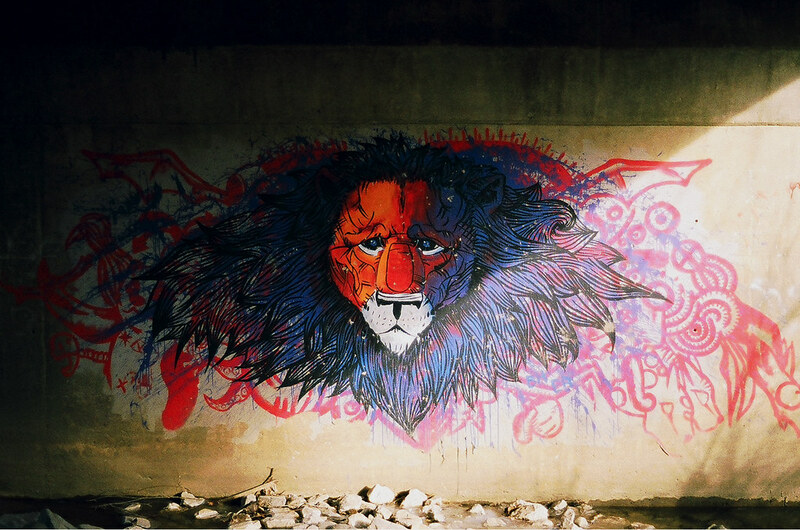 I found this lion painted on the pier under an old bridge leading out of town. 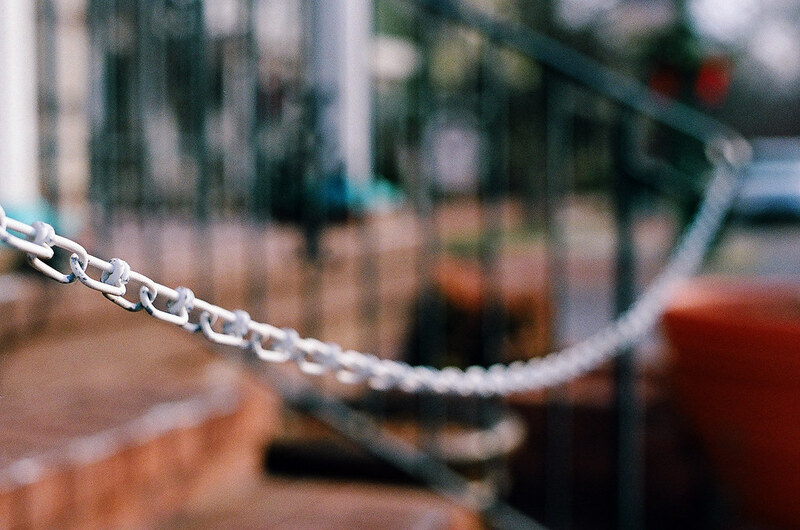 I moved in close to this chain and set the aperture wide to see how the 50mm f/1.7 Hexanon AR lens performed with shallow depth of field. Not bad. I tried again in late spring with the new body. It was lovely to be able to shoot shutter priority. The T3 is large and heavy (though not as much as some other mechanical SLRs of the era), but its controls are all in the places you expect and work fine. Both bodies could have used a CLA to make the controls work more smoothly. But these are robustly built cameras. The meter is likely to be the one weak spot. 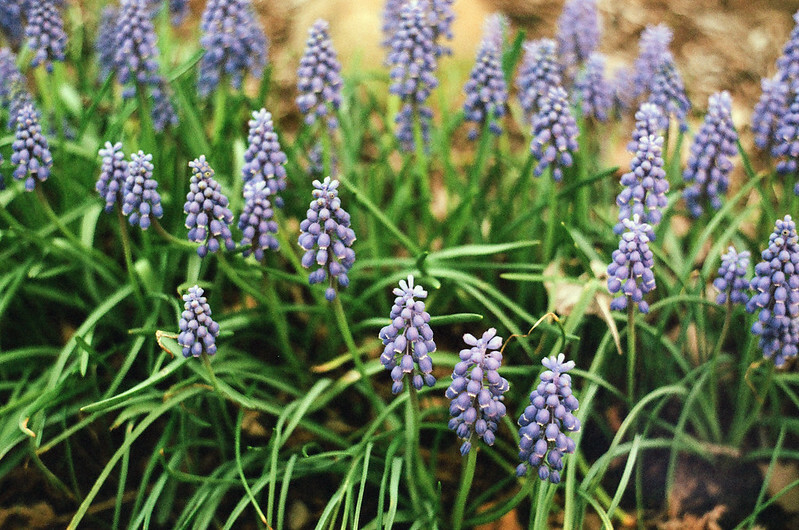 I shot most of this roll of Fujicolor 200 in my front yard, aiming at late-spring flowers. My tulips were past their peak, but this lens really delivered sharpness, color, and bokeh. 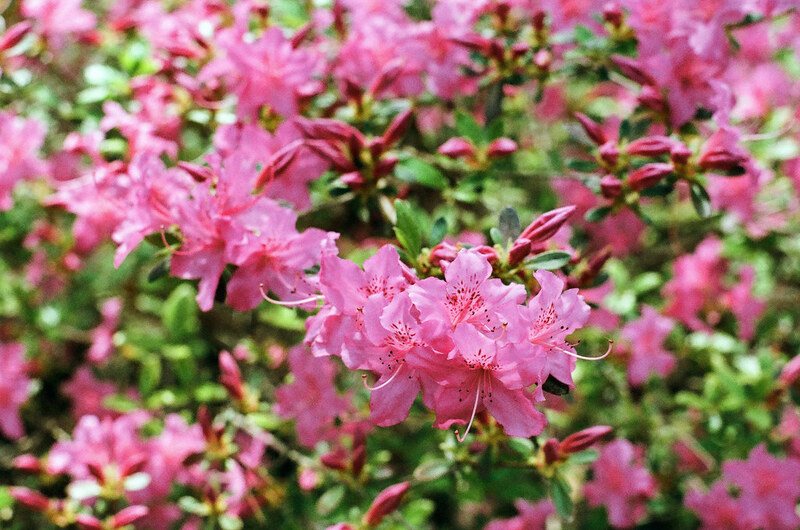 See more photos in the Konica Autoreflex T3 gallery. I like this camera, and I love this lens. If you come upon a T3 with a working meter, scoop it right up.